Lake Nosbonsing is a scenic and popular fishing spot that is located near Lake Nipissing. It’s situated South of North Bay in Ontario, and it is the result of the glacial outflow from the Great Lakes. Lake Nosbonsing is an angler’s paradise, and it offers so many fishing opportunities without the challenges of the big water. 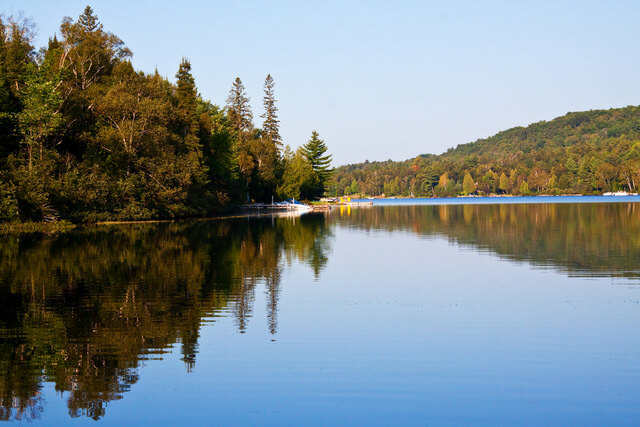 It is tucked away in the Almaguin Highlands, and the magnificent hills only add to the beauty of the lake. It’s an irregular shaped lake that is approximately seven miles long, and it covers over 1600 acres in area. Lake Talon is a lake in Nipissing District, Ontario, Canada that is part of the Mattawa River system and the Ottawa River drainage basin. The majority of the water body is located in Bonfield Township with the rest in Calvin Township and the unincorporated Olrig Township. 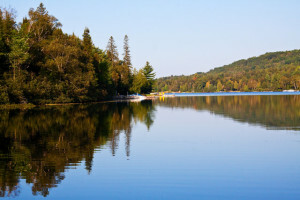 The lake is a popular cottaging spot during the summer, as it is dotted with cottages mostly along the southern shore. It also has a Nipissing University field station on the north shore of the eastern end. 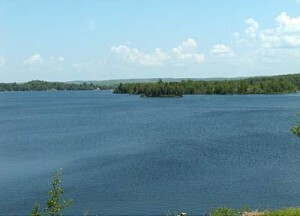 The lake and its shores, with the exception of Kaibuskong Bay, are protected as part of the Mattawa River Provincial Park. The primary inflows are the Mattawa River and the Kaibuskong River, and the primary outflow is the Mattawa River at Talon Chute, which flows to the Ottawa River. Trout Lake is a lake in municipalities of East Ferris and North Bay, Nipissing District in Northeastern Ontario, Canada, approximately 6 kilometres (4 mi) east of the much larger Lake Nipissing. 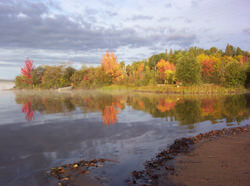 Trout Lake is the source of the Mattawa River and a significant body of water on a well-known historic North American voyageur (fur-trading) route. It is about 11 kilometres (7 mi) long and 4 kilometres (2 mi) wide and exits eastward into the Mattawa River, which flows via the Ottawa River to the St. Lawrence River. Some of the most difficult portages are found on this part of the voyageur route between Trout Lake and the end of the Mattawa River, e.g., Portage de Mauvaise Musique, located at the Talon Chute (named after explorer and voyageur Jean Talon). The City of North Bay (population approx 54,000) draws its drinking water from Trout Lake. North Bay's urban core is located primarily between Lake Nipissing and Trout Lake, although the city limits contain the lake's entire northern shore. Much of the lake's southern shore is located within the township of East Ferris. Lake Nipissing is an inland sea comprised of over 214,000 acres rich in fish life. The lake supports all of the usual suspects, including yellow and blue walleye, small mouth and largemouth bass, northern pike, muskies, and yellow perch. Add to this list the many ‘alternate’ species such as white bass, sheepshead (fresh water drum), redhorse, white sucker, spotted garpike, brown bullhead, channel catfish, lake herring, whitefish, rainbow smelt, bluegill, lamprey, ling, and a host different shiner species and other minnows. 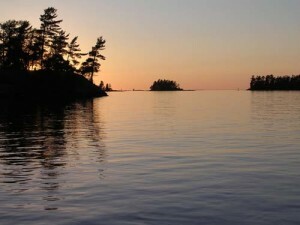 Although there are no known native trout or salmon species in this lake, occasionally a Chinook salmon or lake trout will shoot the various rapids and dams leading into Nipissing from Georgian Bay or upstream from Lake Temagami. Rare but documented cases of catches of these species have occurred along the North Bay water front. Nipissing is an unpredictable lake due to her long west-to-east fetch and shallow average depths. The quality of the ensuing waves will drive the average boater back to shore in a hurry. The bad news is that your week long vacation could be cut in half, forcing you to either target one of many smaller lakes in the vicinity, or simply to pack it in. The good news is that, in this way, Nipissing protects herself and her inhabitants. With an estimated 5% of all Ontario sportfishing hours occurring on Nipissing, and compounded by the apparently unregulated commercial netting of Nipissing’s walleye and other by-caught species that get unceremoniously dumped on rural back roads , Nipissing uses the natural protection of the elements as her only salvation. The accidental introduction of the spiny water flea in the 1990s has also wreaked havoc on Nipissing’s once robust ecosystem. Canadian record fish of all species are still believed to be alive and well though, somewhere on this huge lake. Pick your battles wisely and you could still come up with a catch of a life time. The best general season forwalleye (pickerel)on Nipissing is from shortly after the opener (3rdSat. in May) to roughly the middle of August. Mid summer heat drives the pickerel down deep and out further into the main lake where they are protected by the prevailing wind and weather. The most popular way to target pickerel during this time is with a jig and worm combo. Add a small stinger hook to the rig for those days when the fish are neutral. There’s a short flurry of action again in late September to the closer on October 15thwhen the pickerel return from the open lake. Smallmouth bassfishing on Nipissing can be phenomenal. From the 3rdSat. in June until Dec. 15th, the smallies always seem willing to bite a dark green tube worked with finesse near or on any number of shallow boulder strew flats. These bass are also caught occasionally down 30 feet by pickerel fishermen in the fall. A seven pounder is reported almost every year. Besides all the resident minnow species,Nipissing is also home to a large population of crayfish and this keeps the bass busy and well fed. But one of Nipissing’s special attractions has to be the renowned shad fly hatch that occurs in various parts of the lake in mid to late July. Pickerel, perch, bass, and herring all turn their sites exclusively to this bait bonanza, to the exclusion of everything else. Worm fishermen, be forwarned and make the appropriate adjustment or fish another lake during this time. Largemouth bass are targeted primarily in the many shallow back bays around the lake. Fish Bay, Callander Bay, and Hinchberger Bay in the east, and all of the west arm, west end bays are home to large bucketmouths. Special mention has to go out to the sprawling shallow ecosystem know as Cache Bay. Incoming rivers and creeks should be targeted for their ability to attract many minnow species that spawn in that area. It’s not uncommon either to hook into a giant gar, walleye, jumbo perch , pike, or muskie in the endeavor. Soft plastics get the nod here as well as Moss Boss’s, and small spinnerbaits. Nipissing plays host to sportfishing tournaments, including the Top Fifty Pike Series.Northern pikeare plentiful, and always sporting in the weed infested shallows of the lake. With so much potential real estate to live in, one must do their homework to consistently stay on the pike. The 3rdSat. in May ushers in the open season for pike in the North Bay area and this is when the tournament pike fishermen start to prefish and do their homework. The West Arm, Cache Bay, and all the north shore bays inbetween are popular tournament areas. The eastern end of the lake comes into its own in the deeper weed beds of fall near Hunter’s Bay, South River, Lonely Island, the Manitou Islands, and Callander Bay. The North Shore also boasts many weed lines to attract big northerns. The biggest northerns in the system though are not really weed animals but their habits more closely resemble that of the muskellunge. The largest pike are said to feed almost exclusively on lake herring throughout the summer months in open deep water. When the first major temperature drop occurs in September, these big girls show up briefly back on the deep weed lines and boulder reefs. If you are targeting muskies and you land a 40 plus inch pike, stick around! Both species will utilize the same forage base at this time of the year. My passion rests with the elusivemuskieand this species keeps me on my toes! Muskies are everywhere and nowhere at the same time. When you learn to decipher the markings on your sonar/down scan, you’ll ‘see’ the muskies you didn’t know were there. Because Nipissing is such a fertile body of water, there is always forage available for a hungry muskie. When we target these fish, we are most likely trying to attract a fish that is resting and digesting its last meal. Do this right about the time when the muskie is starting to think about his next meal and you might have a chance. During equally fleeting windows of a muskie’s mood, they’ll hit anything that moves within their strike range. But these windows are small and uncommon. Muskies roam the entire lake from the main deep basin to the sprawling weed flats of the West Bays. Half the battle is finding the fish, so when you raise one close to the boat but it won’t hit, don’t despair. Come back to that spot during a change in the wind or cloud cover, or changing light conditions to see if the fish’s mood has changed. Perseverance is the name of the game to be a successful Nipissing muskie hunter. Fish over 50 pounds have been taken from these waters in recent years. Learn the movements of the other game fish and the muskies won’t be far behind.